Since 1893, The Field Museum has been wowing visitors with its amazing collection of specimens and artifacts. From beloved Sue, the largest, best-preserved, and most complete Tyrannosaurus rex ever found, to one of the largest collections of diamonds and gems in the world, the museum offers a never-ending list of amazing things to discover within its historic walls. This fall, the Field Museum is hosting so many interesting events — from a bird spotting excursion to an open-air market of its very own — that a visit or two is a must-do. Here are five things that we&apos;re excited to see and do this fall at The Field. Identify your interesting finds at ID Day. Saturday, September 17, 10 a.m. to 2 p.m.
ID Day is like Antiques Roadshow for the amateur scientist set. Guests are welcome to bring in their latest and greatest interesting yet mysterious natural discovery — think dry bones, fossils, rocks, meteorites, seashells, feathers, etc. — and the museum&apos;s scientists will help you figure out its hidden identity. Make sure your specimens are clean and dry. Live insects are welcome but make sure they arrive sealed in a jar. Keep any animals at home. Even if you don&apos;t have anything to bring in, this is an exciting day of discovery and specimens will be on display for you to see and touch. ID Day will take place from 10 a.m. - 2 p.m. on September 17 (a Free Day for Illinois residents) in The Field Museum&apos;s main hall (near SUE the T. rex). Shop The Field Museum&apos;s very own farmer&apos;s market. Saturday, September 24, 2 p.m. - 6 p.m.
Why shop at your local grocery store when you can head to The Field Museum&apos;s farmer&apos;s market? In addition to the bounty fresh food from local farms, you&apos;ll enjoy live music, craft beers, gorgeous lakefront views and of course, a visit to the museum! Field Market Days are free events presented by the Near South Planning Board and families and all ages are welcome. The farmers market takes place rain or shine on the museum&apos;s South Terrace. Celebrate science with your favorite tween. 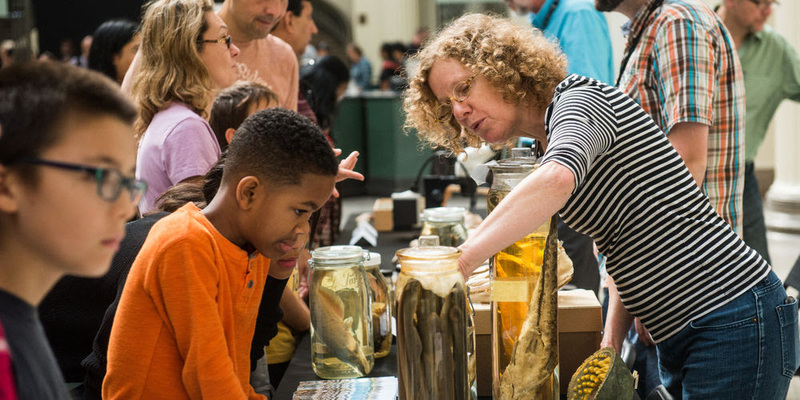 Bring your favorite tween to The Field Museum for a new series of events — Tween Saturdays — designed especially for kids ages 11-14. In this fall&apos;s six events, participants will examine interactions between different elements of the natural world, giving your tween the chance to try hands-on experience with real issues in science. Tween Saturdays are $20 per nonmember and $15 for Museum members. Set off on a birdwatching adventure. Sunday, October 2, 8 a.m. - 10 a.m. Throughout 2016, The Field Museum is leading birding field trips as part of the Forest Preserves of Cook County&apos;s Big Year Birding competition. On the October 2 expedition, you&apos;ll have the change to spot birds as they make their way from north to south for the winter. You&apos;re likely to see late-departing warblers, sparrows, and other songbirds, as well as recently arrived ducks on the wetland at Eggers Grove Forest Preserve. Expeditions depart at 8 a.m. from the entrance to the preserve at 112th St. and Avenue E in Chicago. Learn about the fantastic fish that live in our oceans, rivers, lakes, and ponds through play at PlayLab. Every third Saturday of the month 11 a.m. - 2 p.m. If you haven&apos;t visited the Crown Family PlayLab with your little ones you&apos;re missing out on the fun! This amazing playspace is inviting families out this fall and winter to explore a theme through storytelling, music, arts and crafts. This fall the focus is on the fantastic fish that live in our oceans, rivers, lakes, and ponds. The Crown Family PlayLab is free with basic admission and is open Thursdays through Mondays from 10 a.m. to 4 p.m. with last admission at 3 p.m.
For more information on upcoming museum events and programs, visit The Field Museum at fieldmusuem.org.